I have gradually been trying to sort the girls room out by rearranging the furniture and organising it. Now that I have the furniture where I want it (for the time being anyway), I wanted to do some projects. 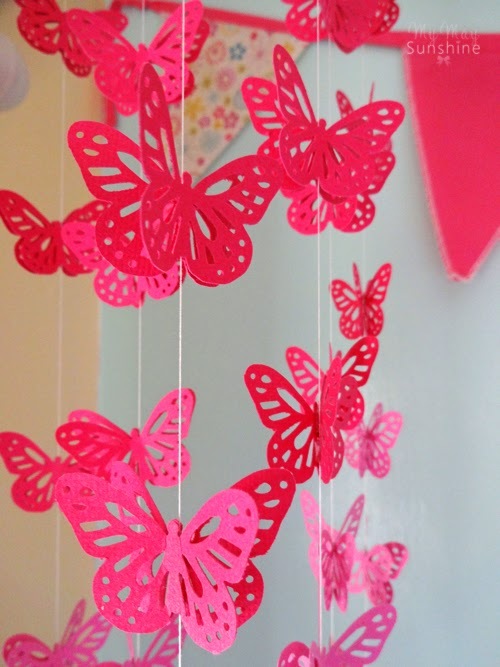 One project that I wanted to do was to make another butterfly mobile like the one I made a few years ago. The first one I made was all white and used two embroidery hoops. I decided to use another embroidery hoop for this mobile but I only had one as I was trying to use what I already had and I think it looks better with one anyway. 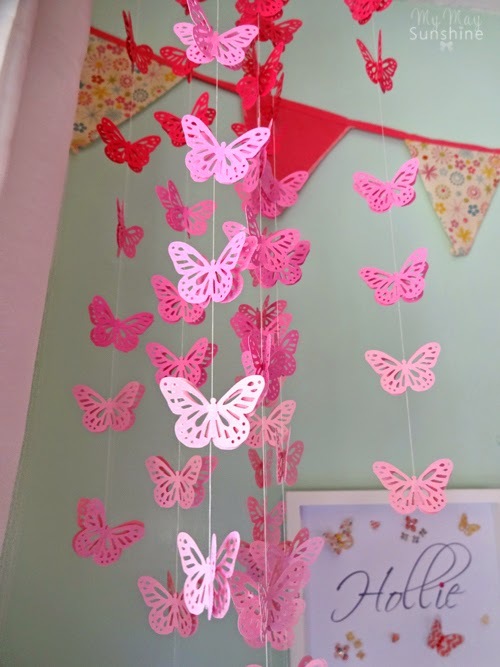 The butterflies were punched out of three different coloured card, a light, medium and a dark, to create an ombre effect to the mobile and I used a large Martha Stewart Monarch butterfly punch. I love this punch as it creates a more detailed butterfly than the one I used before. 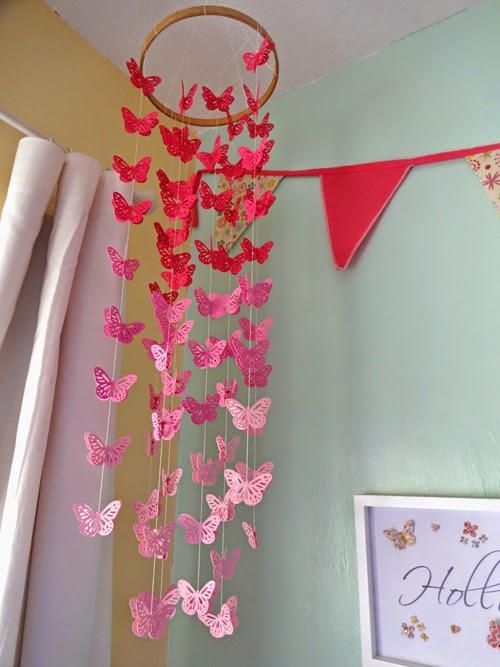 To attach the butterflies to the mobile, I used some thin white cotton thread. I just tied the thread to the embroidery hoop. To create the ombre effect I started with the darker butterflies at the top and then the middle colour and then the lightest at the bottom. 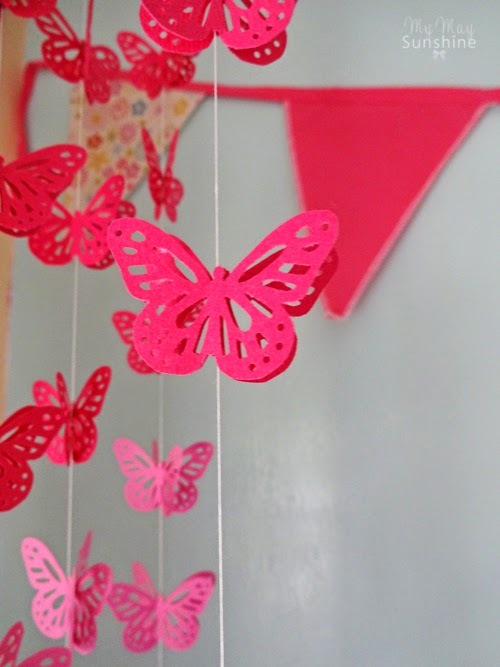 To attach the butterflies I used a glue dot in the middle of one butterfly, stuck it to the thread where I wanted to position it and then stuck another butterfly to it in the same position and then bent the butterfly to make it look like it was flying. I really like the ombre effect as it adds more character to it. I think this mobile as really easy to make and can be done in stages if you haven’t got a lot of time in one go. 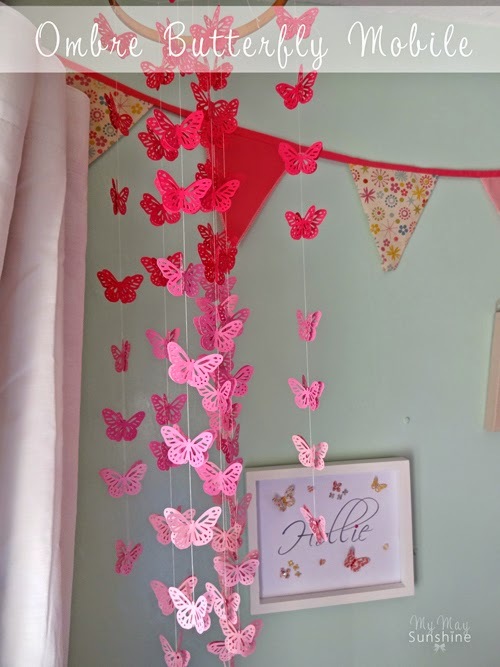 It would make a nice feature in a bedroom or playroom and you could change the butterflies to another shape like stars which I have done when I made one for my nephew. It would make a lovely gift too. Would you consider making one? Maybe you would just prefer to receive one as a gift? Let me know.